When I saw this picture being shared, I asked pro-lifers (those of us who believe that abortion is, prima facie, morally indefensible) not to share it. I asked them to be more careful and critical than that. Why did I say this? I might have raised a concern about the second claim. It seems a bit much to say that if the unborn child is a human person then no justification Is adequate. I think that adult human persons are, obviously, human persons. But I think there can be a justification for killing an adult human (for example, in defending a helpless person from a violent attack). I think it’s plausible that abortion is justifiable if both mother and child are sure to die if the pregnancy continues (e.g. an ectopic pregnancy). But I know that some pro-lifers may not share that view, so they might not accept that the second claim is false. I actually asked people not to share it and said they needed to be more critical because the first statement here is straightforwardly false, something that I think should be granted without hesitation. The fact (if it were a fact) that the unborn child is not a human person would not automatically mean that no justification is required for aborting it. Whether or not a justification would be needed in order to abort a non-human thing will depend on further considerations. Firstly, there exist things other than human persons that have a status such that we would need a justification before killing them. Suppose a gun-happy traveller went on a wildlife adventure and shot every creature in sight. Lions – BANG! Zebras – BANG! Gorillas – BANG! You name it, he killed it (apart from humans, please be assured). You might not think much of the mosquitos he swatted or the fish he caught for dinner, because we don’t think much of the status of a mosquito, and we probably don’t think much of the status of a fish, and if we do, we probably think that there was a justification, namely dinner. The status of a fish, most of us think, does not outweigh the justification. But all of us, I sincerely hope, would think there is something wrong with killing all these creatures. There is no justification for doing so. If the unborn child were not a human person but had the status of a gorilla, a justification would be required for aborting it. Now, let’s turn away from our gun-happy traveller and back to the case of a child in the womb and abortion. Suppose for argument’s sake that the unborn child is not a human person. Suppose an unborn child has the same moral status as a gorilla. Does it follow that no justification is required for killing it? Certainly not, since you do require a justification for killing a gorilla. So if the unborn child were not a human person but had the status of a gorilla, a justification would be required for aborting it. You might believe that such a justification exists (for example, it is using a woman’s bodily resources, and you might believe something with the status of a gorilla doesn’t have the right to do that if the woman doesn’t want her body to be used that way). Fine, but a justification would still be required. Some people responded to this fairly mundane observation with what seemed like extraordinarily strained reasoning, making claims that the speakers cannot possibly have believed, on careful reflection. For example (this is not a direct quote): If the unborn child is not a human person then it follows that it has no more status than a rotten tooth to be pulled. Or, if a thing is not a human person, then no justification is needed for killing it, so no justification is needed, for example, for slaughtering baby dolphins at will. How such responses could seem plausible to people is beyond me. Secondly, there is another way to see that the first claim in this image is false. Even if the unborn child had no interesting moral status at all, it’s still possible that we would require a justification for killing it. This is because it’s possible to make a decent case for the prima facie wrongness of abortion that does not depend on the status of the unborn child. Don Marquis has made an argument like this in his well-known article, “Why Abortion is Immoral.” There, he argued that what is wrong with killing people generally is that it takes away a future life, in particular a “future like mine.” When we kill an unborn child, we are taking away a “future like mine” of an actual something, regardless of whether or not we regard that something (the unborn child) to have moral status right now. You might not accept that this is a good argument, and you might not think that other arguments against abortion that do not establish the status of the unborn child are good arguments. But such arguments are possible and there may even be a good one. Consequently, for this second reason, it does not seem true that if an unborn child is not a human person then abortion automatically requires no justification. 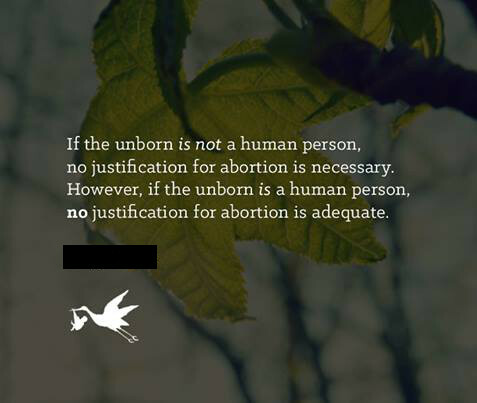 Therefore it is not true that if the unborn child is not a human person, no justification is required for killing it. There are two good reasons for denying this. Firstly, even if the unborn child is not a human person, that doesn’t automatically mean that it doesn’t have a status making it worthy of protection. Secondly, it may be that abortion is justication even if the unborn child has no interesting status at all. This is not a complicated or subtle line of reasoning. In short, the claim in this image concedes too much to those who advocate for abortion rights. A few brave souls granted the point, but in general the response from my fellow pro-life Christians was a sort of rush to defend the picture. Employing my sixth sense (as some will perhaps think I am presuming to do), I think there are a few reasons for the reaction. You become like one of the King’s men who says “Splendid idea, your majesty” no matter what they say. Firstly, the speaker (who I have decided not to name) is well-liked by Evangelicals as an apologist for the faith. That gets him a sort of status akin to the status held by pseudo-prophets in some Pentecostal movements. If you challenge them, the reply is “touch not the Lord’s anointed!” There’s a similar kind of celebrity protection programme in place in cases like this too (although that isn’t necessarily the speaker’s fault). The truth is, you aren’t helping a public spokesperson or apologist by going easy on them or giving them your agreement (and even defence) without critical analysis. You become like one of the King’s men who says “Splendid idea, your majesty” no matter what they say. That’s not really what the King needs, and you’re not really doing him any favours. We pretty easily detect cases of other tribes doing this, don’t we? Thirdly and lastly, a number of the pushback comments I got seemed to suggest that the speaker’s “real point” or overall position or “all he is saying” is just that the status of the unborn child really matters to the abortion debate, and those who advocate abortion rights frequently overlook this and beg the question, using arguments that just assume that the unborn child isn’t a human person. The suggestion is that if I oppose the particular claims made in this quote, then really I’m opposing this position, which is the speaker’s position. In brief, because I am saying that a particular claim in favour of the pro-life position is untrue, my criticism is perceived as an attack on the pro-life position itself, so the defence mechanisms of the pro-life machine are triggered and go into action to fight off the threat. But the truth is, I agree with these more general claims that are offered up in the name of “all he is really saying.” I agree that the status of the unborn child is crucial in the discussion. I agree that many of the arguments for abortion rights simply gloss over that detail and end up begging the question (by assuming that the unborn child is not a human person). But I am not criticising any of those claims. I am criticising a specific proposition that has been expressed, a proposition that is not identical with those other claims, with which I agree. This proposition does not just state the general pro-life position, and by rejecting this proposition, I am not rejecting the case against abortion. What if I told you that you could reject flimsy pro-life slogans while still being pro-life? As some of you already know, I consider myself pro-life. Abortion, especially in the sheer numbers we see in the developed world today, is a horrific evil. But we don’t help our cause with unreflective and frankly untrue sound bites on the one hand, or the herd mentality that defends those sound bites because they came from our team on the other. Posted on May 21, 2015 June 13, 2018 by GlennPosted in bioethicsTagged abortion, bad arguments, bioethics, social issues. Previous Previous post: Happy Easter 2015! Perhaps you have overlooked the nature of Christian teaching and the Christian religion. It’s not really that complicated, and it appeals to simple folk with simple rules. Like don’t kill. There are no qualifications: don’t pick up stones and throw them at people, that’s sin, don’t bear the sword, because Jesus taught us not to use swords, even against the guilty and those who are attacking you or your neighbour. Don’t resist evil, be purely good, like God, even to the bad. Don’t use violence or coercion, regardless of justification or legal paperwork or to collect debts. Seek first his kingdom and don’t worry about the bad guys. Be perfectly good, and don’t do even a little evil regardless of situation or justification or laudable ends. Be perfect. Let him who is wrong continue to be wrong, let him who is vile continue to be vile. Just patiently endure evil and violence and wait for the day of judgement. Why should you be surprised to find that the followers of Jesus and the opponents of abortion have a simple and absolute and unqualified opposition to the practice? If they took the same approach to coercion, force, violence and adultery as they do to abortion they would be faithful followers of the founder of the Christian religion. The Christian religion is a pretty big thing, so overlooking one type of Christianity doesn’t overlook another, much less all of it. Glenn, your analysis is correct but you are analysing the phrase as if it is dialectic, but in fact it is rhetoric. All it is trying to do is focus men on the main issue concerning abortion: the humanness of a fetus. I agree that it is rhetoric, but I’m not comfortable with passing around rhetoric that’s not really true. I’m even less comfortable when this is done in the name of a cause I believe in, as it creates the opportunity for critics of that cause to parade the fact that our “side” relies on untrue but memorable rhetoric. I think this criticism is a bit harsh because like a previous commenter said, this is rhetoric for effect. While in a strict, literal sense you are quite correct that it is not true. However, I think most people could read between the lines adequately enough to understand the point. After all, typically the primary point of pro-choice advocates seems to be either that 1. fetuses don’t fully qualify as a human person or 2. that fetuses can properly be killed because they impose their life on the mother without any right to do so. I think that many times people of various views (Christian or not) embrace soundbites that are demonstrably false in any sense whatsoever but this doesn’t seem to me to be worthy of condemnation. In general, people will get the larger point, which is to say that killing a human being is wrong. If the writer of this meme had to point out every obvious exception, the meme would lose all effect and not serve it’s intended purpose which is to give people a simple, pithy phrase they can easily remember and think about.